Description: this larger T-Rex figure measures some 25 centimetres in length and stands just over 15 centimetres tall. It's posed in an attack posture, with its tail bent upwards and pointing to the left and its head slightly tilted up, as if it were looking at something just above him. Its legs stand far apart from each other. This Rex is pretty skinny and has a small body, it’s mostly head, limbs and tail. A very large dino damage would is found on its right flank, showing ribs and red muscle tissue. The upper piece of exposed tissue is actually a button which activates a shrieking roar, as if the creature is in pain. A second roar, more aggressive and imposing, can be made by pulling its right arm down: when doing so the mouth will also open. A third sound can be made by having the T-Rex stomp on the ground: logically this is called a stomping noise on the box, though it could also serve as a crash sound. The quality of all three sounds is not very good, since static is heard as well. The two roars are the same sounds the Arctic T-Rex figure produces. This figure features an intricate paint job. Most of the top and lower part of the body (back, upper part of the tail, neck, back of the head, lower jaw, arms, most of the legs, belly, throat and lower part of the tail) are coloured grey, with this colour being somewhat darker on the torso. In between the lower and upper parts of grey, black colouring is applied, which for the most part gradually shifts into grey in the figure's lower regions (especially noticeable on the legs and flanks), while a similar effect is achieved by black spots on the throat. Most of the face and upper jaw is also black, with a series of white dots running around the upper jaws, facial ridges, snout and eyes. From the snout to the tip of the tail a row of black spots runs over the figure's top parts, each spot encircled by an orange line. These spots get increasingly bigger towards the centre of the figure, with the biggest spot located right above the legs, and diminishing from that point on. In a similar fashion, orange spots with black lines around them are found on both legs. A fairly small white JP III logo is located on its right upper leg. Rex has got a pair of small yellow eyes and the claws on both hands and feet are all painted black. Analysis: like the other electronic CamoXtreme figures, this Canyon T-Rex, the biggest of the bunch, features a superb and original paint job, one that would not be surpassed afterwards. It has a very rugged and provocative look to it, establishing this T-Rex is not to be fooled around with, in canyons or otherwise. Of course, whether the creature would blend in in a canyon environment depends on what canyon it is, since not all canyons are alike (that would constitute a stereotype!). The Grand Canyon terrain for example is quite red in appearance, and this Rex would probably stand out there (which it probably would anywhere despite its camouflage, since it's not a small creature). A Canyon environment is kind of an odd choice on Hasbro's part, a volcanic area would probably suit this paint job more, though this Tyrant Lizard King looks cool in any environment. 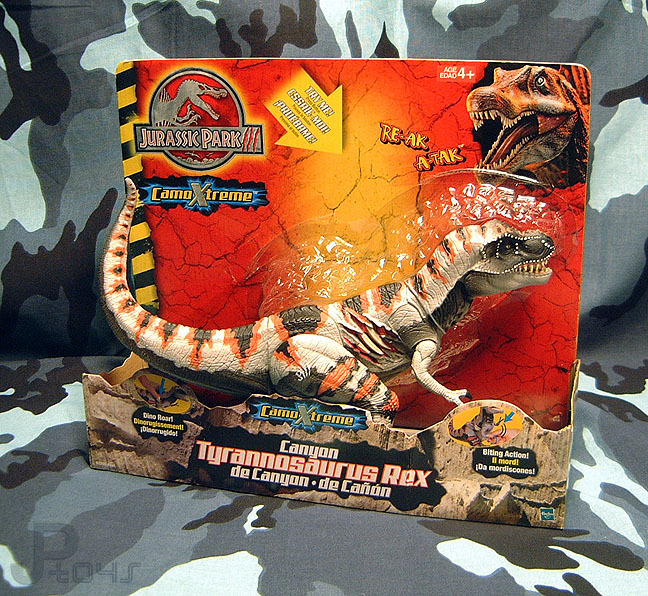 It's also good to see the JP III logo isn't as big as on the smaller electronic dinosaur figures from this line: this way it doesn't attract attention to itself very much. The only downside to the paint scheme is the split between the torso and tail sections of the figure's body: the black paint on the tail ends rather abruptly there, making it look phony. This is undoubtedly because of the way the legs are posed, since the black line seems to be continuing on the legs. Needless to say, in some poses the paint job reveals itself to be less detailed than it should. But it doesn't make this figure's first impression any less appealing and the overall paint job suffers little from it. Apart from the paint job, this figure retains its former imperfections. The torso is too small and thin, making this animal seem disproportionate. The massive dino damage on its right flank is a major nuisance, as is the poor quality of the sounds. The stomping sounds produced by bashing this figure's feet down cause the figure's electronics to break all too easily. And lastly, the active pose this figure assumes hinders playability despite the usual range of poseable limbs. In a harsh judgement, this paint job basically deserves a better sculpt. Repaint: yes. This figure was originally featured in the JP III toy line. It would be repainted twice again for JP Dinosaurs 2 and 3. Overall rating: 7/10. Despite its many shortcomings, this T-Rex got a fantastic makeover making it appear much more awesome than its JP III predecessor (or any of its repaints to follow), even though there's still a lot to be said against this particular sculpt. The CamoXtreme Canyon T-Rex is definitely harder to find than most other CamoXtreme dinosaurs (except for the Night Raptor maybe) but you can still find them irregularly on eBay, though prices haven risen enormously of late. Unfortunately this figure was not imported in the Benelux or the UK like many other CamoXtreme figures, making it also much harder to find there.